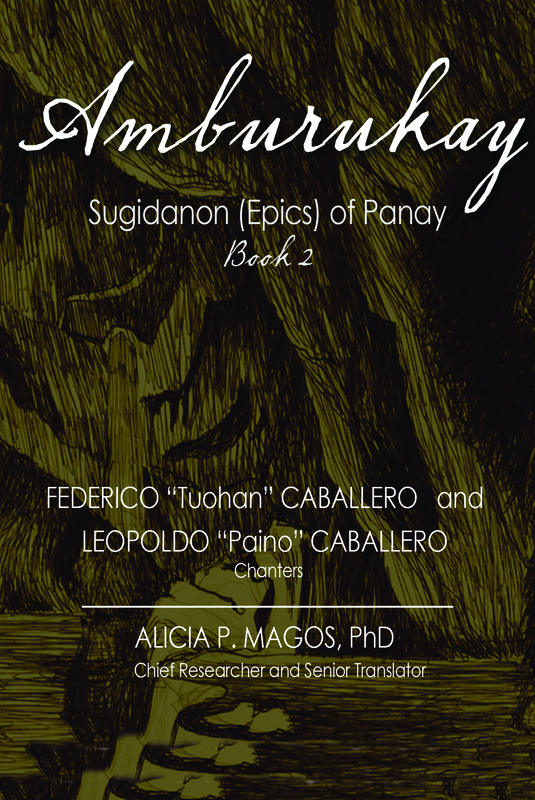 After twenty-five years and hard work— recording, transcribing, translating, cross-checking and more—the ten epics of Panay are finally out. Book II, titled Amburukay, centers on the hilarious character of the old ugly Amburukay who demands payment from Datu Labaw Donggon for the theft of her gold pubic hair. The allusion of a sexual innuendo brings to light the value of keeping a tuos, a customary law on a verbal promise which is sealed with a precious object. Have a feel of the archaic language and culture of the indigenous people of Panay, straight from an ancient island of the Philippines. Federico Caballero was born seventy-six years ago near the stream of the river Pan-ay at the border of Masaroy, Calinog, and Tapaz, Capiz. A Gawad Manlilikha ng Bayan (GAMABA) Awardee for the year 2000, he comes from a long family line of epic chanters. Such exposures harnessed his skill and love for epic chanting (sugidanun) at an early age. In SY 2000–2001, together with Dr. Alicia P. Magos, he helped pioneer the first School for Living Tradition (SLT) in the Visayas located in Barangay Garangan, on the border of Tapaz, Capiz, and Calinog, Iloilo. In that informal weekend schooling, he is helped by his siblings and relatives in teaching epic chanting together with the other arts. Leopoldo Caballero, aka Paino (one who thinks), one of the seven children of the binukot (kept-maiden) Anggoran, sings to heart Amburukay, a hilarious character, enjoyed by children as a bedtime story. Dr. Magos, a sociocultural anthropologist by profession started work on the epics almost twenty-five years ago. Her interest in the indigenous people started with her early exposure on their Negrito workers and later on the mountain dwellers of Central Panay—the Panay Bukidnon—in 1992. Her long mountain treks on the rugged mountains of Panay started in 1988. She is also a multi-awarded professor and now Professor Emeritus.